Did I tell you I'm trying to learn Italian? I took Italian as one of my three classes last semester, and this semester I'm continuing with an evening course. Luckily, having taken Spanish for years and having a bit of a Latin background really helps. Obviously, Italian is different, and I'm trying to nail the hand gestures that seem to go along with each phrase, but there is one thing that I have had no trouble learning. 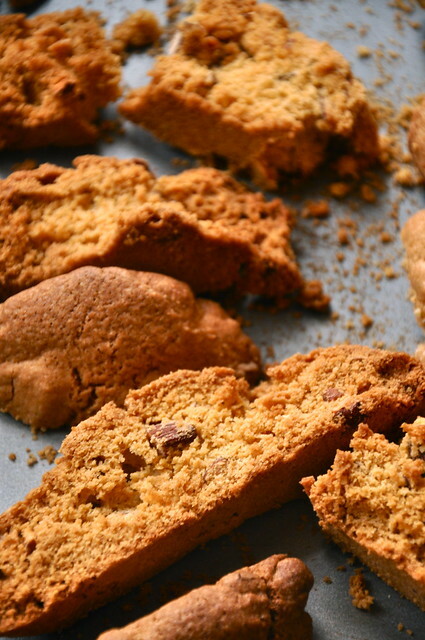 Biscotti means twice baked. Maybe this little tidbit of information stuck in my brain because I made the connection that 'bi' means two (bicycle, bilingual, etc...hey turns out I was paying attention in high school English after all!) But I think the more likely reason is that biscotti just so happen to be incredibly delicious cookies. I have this feeling that my brain focuses harder than usual and that my ears perk up at any mention of food, which could explain my oh-so-useful ability to recall the name of a dish with such ease. 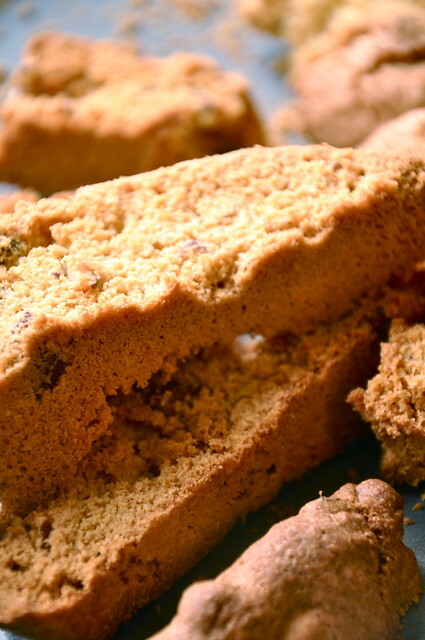 So whether or not you speak Italian, whether or not you even care what biscotti means, I can guarantee that you will want to bite into one of these wonderfully crunchy cookies. They're sweet and crumbly, in the best way, and you won't even feel that guilty if you sneak another cookie, or two, or three from the cooling rack before you invite your friends over for coffee to help you finish off the rest. 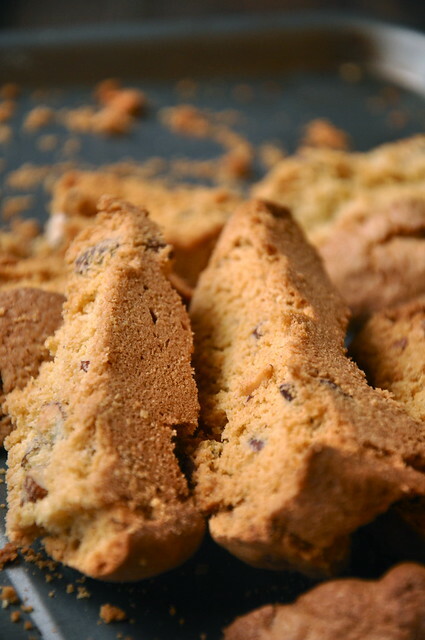 So come on, facciamo biscotti!! Preheat the oven to 350. Whisk together flour, baking powder, baking soda, and salt. In a separate bowl cream butter and sugar until light and fluffy. Add eggs one at a time, scraping down the sides in between. Add zest and juice of orange and beat to combine. Fold in almonds. With floured hands, divide dough in half and shape each half into a log. Place logs on a cookie sheet, patting them down until they are about 3 inches wide. Bake for 30 minutes, until dough is firm to the touch. Transfer loaves to a cutting board, and, using a serrated knife, cut each loaf crosswise on the diagonal into 1/4-inch slices. Arrange slices on baking sheet and return to oven, baking for 10 minutes more. 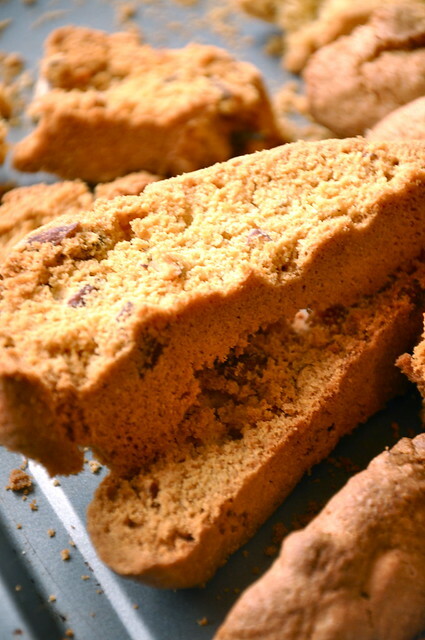 Turn biscotti over and bake for 10 minutes further. Transfer to wire racks to cool. I have never been a biscotti lover but I think its one of those out of sight out of mind things because now that I've read this post I got me some biscotti brain.